It’s easy to be a bit overwhelmed watching a film in the company of 9,999 other people, on the biggest cinema screen in Europe, but your trusty critic is too smart for that. Actually its oddly dislocating; the screen seems to be miles away and the sound gets a bit lost in the vastness of the arena. But still, it’s an historic moment. Or something. So, where were we? When we last saw them, the four young Pevensies, Peter (Moseley), Susan (Popplewell), Edmund (Keynes) and Lucy (Henley) had just been catapaulted back to 1940’s London after ruling in Narnia for some 15 years. We pickup the story a year later, when Susan is just getting used to being home again, and is beginning to attract masculine attention, not all of it wanted, Peter is fighting against being ordinary, and Edmund has matured enough to be his loyal supporter. Lucy seems, oddly, the most mature of the lot. But before that, we are hurled straight into Narnia, and a very different Narnia it is; we open with a woman screaming in the pangs of childbirth. The newborn, it turns out, is the nameless son of the ‘Lord Protector’ Miraz (Castellito), and his arrival in the world poses a clear and present danger to the rightful young heir, Caspian X (Barnes). Making his escape with the help of his tutor Doctor Cornelius (Vincent Grass), a renegade dwarf and friend to Old Narnia, Caspian makes his escape into the woods. For Caspian is a Telmarine; a member of an alien, conquering race, who have driven the indigenous Narnians into hiding and believe them to be extinct; he discovers the Old Narnians are alive and thriving, though in hiding, when they find him; one of them, Nikabrik (Davis) would be happy to kill him, but Trufflehunter, a badger (Stott) and Trumpkin (Dinklage) defend him, and Caspian promises them that, should he become king, he will free the Old Narnians and restor them to their rightful place in the kingdom. But as Caspian has actually blown Queen Susan’s horn, and set in motion an unexpected train of events. The Pevensies are sucked from the tube station to a beach in Narnia where they are at first delighted and then puzzled when they realise that the ruins that they are standing in are Cair Paravel itself, their old home. They rescue Trumpkin from the Telmarines who are planning to drown him and, discovering what has happened in the thirteen hundred years they have been away, decide to go to Caspian’s aid. Why why why do filmmakers always think they can improve on source material? Admittedly the restructuring of the back story, which could have been a bit tedious, is well done, but why do Peter and Caspian have to be set up as rivals, making Peter, who was the High King of Narnia, look like a petulant schoolboy. And only bringing Aslan in at the very last minute does not add to the suspense, it makes poor old Aslan seem uncaring in the extreme. He is also looking extremely fluffy, as if he spent the last thousand years conditioning his mane. On the other hand, turning Susan into Legolas and giving her a slightly lame flirtation with Caspian, while enlivening to the teen audience, may prove problematic as 1. Susan is never coming back to Narnia and 2. Caspian will meet his wife in Voyage of the Dawn Treader, which is pre-production now. Ben Barnes is pretty, but vacant as Caspian, but there are lots of fun new characters. Reepicheep, voiced by Eddie Izzard, and Trumpkin lead them, with Dinklage acting madly with his eyes through prosthetics and a terribly scraggly wig (he needs Aslan’s conditioner). I won’t go into the inconsistencies caused by the filmmakers need to up the ante; fact is, this is an entertaining sequel and I was won over entirely whenever Georgie Henley was on screen. 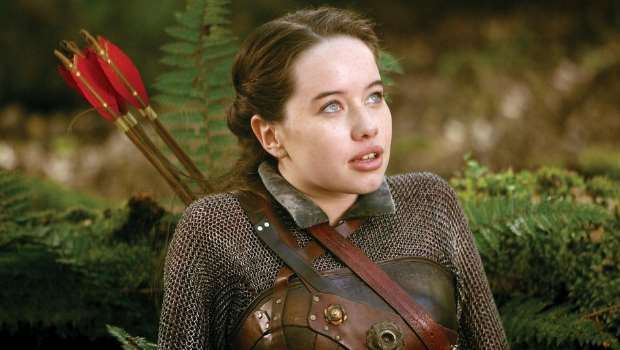 She is an utter delight, and I can’t wait to see her in Dawn Treader, when she and Skandar Keynes, funny and charming now that Edmund is no longer evil, come out of pouty Peter and Susan’s shadows.